Please join the Seminole Heights Wine Society for our Weekly Educational Wine Tasting, every Thursday at 7pm. 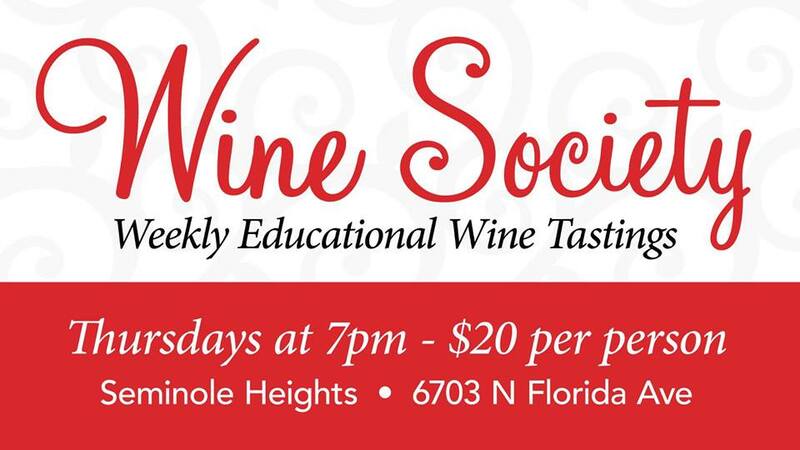 If you are interested in learning more about wine, The Seminole Heights Wine Society is the group for you. Our weekly wine tastings are fun, educational, and held in a casual and social environment. You will discover and taste different wines while learning about proper food pairings - all for only $20 - which includes the wines and the food pairings. RSVP is not necessary but always appreciated. You can call the Seminole Heights Wine Bar at 813-999-4966 or email us at SocietyWineBar@gmail.com.